An anti-fascist group is organising a demonstration in November to protest against the appearance in Scotland of a former Trump advisor accused of being a white supremacist. Stand Up To Racism Scotland is due to hold a protest outside the Edinburgh International Conference Centre (EICC) where controversial political figure, Steve Bannon, is due to speak. 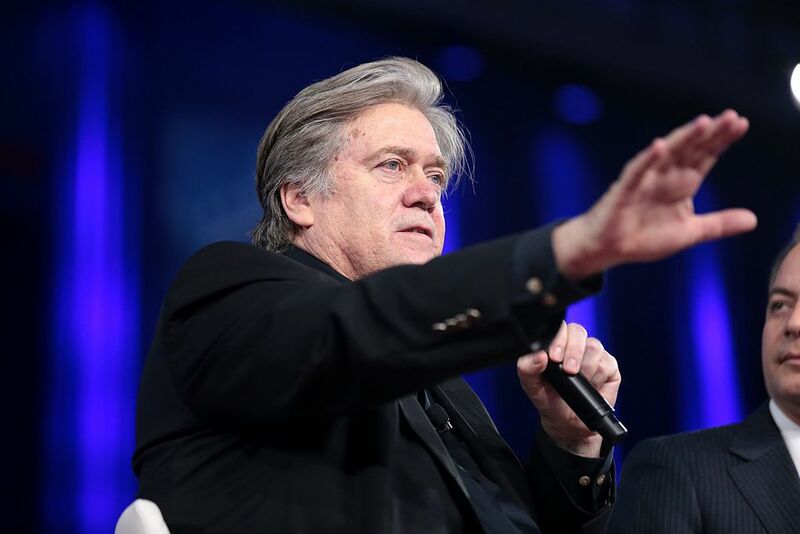 After we revealed that Bannon was due to talk at News Xchange 2018, an international media event co-hosted by the European Broadcasting Union (EBU) and the BBC, Scotland’s First Minister, Nicola Sturgeon, pulled out. The First Minister was due to open the conference at a reception at the National Museum of Scotland on 13 November, the evening before Bannon is scheduled to speak in the conference centre. Stand Up To Racism Scotland is using Facebook to organise a protest outside the EICC on the 14 November and asking people to complain to the BBC. They have also asked the organisers to withdraw Bannon’s invitation to speak. A statement by the group on Facebook page says: “Stand up to Racism condemns the invitation of the European Broadcasting Union’s News Xchange committee to alt-right guru Steve Bannon to speak on 14 November at its event in Edinburgh. “Organisers describe Bannon as a “political strategist”. He is attempting to build an islamophobic international of far-right groups and is looking to fascist Tommy Robinson here in Britain as a key figure for his movement. At time of writing nearly one thousand people had indicated interest in attending the protest. Bannon was the driving force behind the right-wing Breitbart News website before emerging as one of the key players in Donald Trump’s rise to power. He served as chief strategist at the White House, a role that gave him a direct line to President Trump, before he left his post in August 2017. Since leaving the White House, Bannon has visited Europe, offering support to far right parties such as France’s National Front, Alternative for Germany, Austria’s Freedom Party and the Italian League. After we revealed Bannon was coming to Scotland, Nicola Sturgeon said she would not attend News Xchange 2018. Ash Sarkar, of Novaramedia, was due to be a participant on a Question Time panel but said she would also withdraw from the event. But other invited speakers told The Ferret that they will attend the event. ITV News commented on behalf of newsreader, Julie Etchingham, who is also due to attend. “Julie has been invited to moderate a panel session at the annual News Xchange conference, which will focus on the crucial issue of diversity and engagement in broadcast media,” said a spokesperson. Michaela Kuefner, chief political editor of Deutsch Welle, also confirmed she would attend. “Ms Sturgeon is a politician. I am a journalist. I don’t take a political stance – it is my role to report on and analyse politics,” she said. “Excluding voices like Steve Bannon who have become key voices to the populist right is ducking away from that challenge. It is now up to the BBC’s interviewer Sarah Smith and all of us attending to live up to standards of impartiality and critical analysis,” Kuefner added. The event organiser EBU has posted a statement on its website. “Steve Bannon is a key influencer in the rise of populism – one of the dominant political trends of our times. He has been invited to speak at News Xchange this year because his views are relevant to today’s society at large and therefore to the media industry,” it said. The BBC said: “News Xchange is an annual EBU journalism conference which the BBC and other broadcasters support to make happen. Steve Bannon was invited on behalf of the EBU’s News Xchange committee. Additional reporting by Jamie Mann. Photo thanks to Gage Skidmore, CC BY-SA 2.0.